Bet they still do better than the Knicks. "Every team has a grand plan, and we're moving slowly, step by step, because it's easy to make a strong team, but it's very difficult to make a championship team. So we are on the right way and I'm expecting our championship within three years now," Prokhorov told reporters Friday morning after participating in a ribbon-cutting with partner Bruce Ratner and New York City Mayor Michael Bloomberg, marking the ceremonial opening of the $1 billion Barclays Center in downtown Brooklyn. "He said five, so we're down to three. To me, it's a great goal," Nets general manager Billy King said. "I'd rather him say that than say, 'Hopefully we're going to win a championship at some point.' That's the goal, and I look forward to the challenge." -Mikhail Prokhorov/Billy King in 2012. Ainge is one hell of a GM. They aren't planning on any of those picks being in the lotto. May not work out that way. 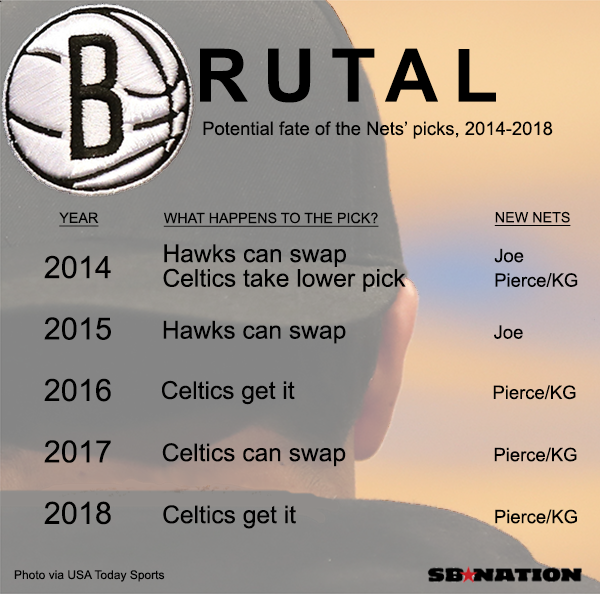 As the nets get worse the Celtics can even be a playoff team and still get lottery picks. I wanted to see Pierce retire a career Celtic but this is potentially fantastic. That's not saying much. Knick management is just all over the place even with PJ. New York basketball in general is dead. what have tha gizzardz taught us?